After I watched “Jaws” so many years ago as a small child, I was so afraid of the beach that I would outright lie that I was allergic to the ocean as an excuse. Yeah… I claimed I was allergic to the water so I wouldn’t be pulled under by a shark. Today’s app is a hungry mutant piranha that eats sharks… I really don’t know which nightmare is worse. 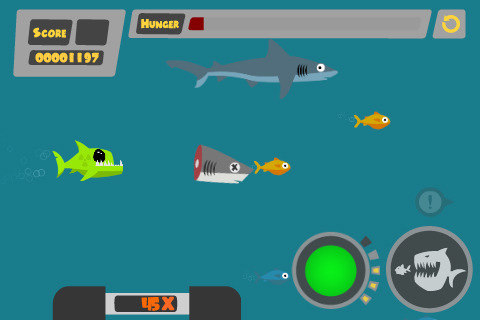 Hungry Piranha is a side-strolling game where you eat fish and sharks while dodging the torpedoes and mines that humans have thrown at you. Released by Coffee Arcade, Hungry Piranha is available on the iPhone, iPod touch, and iPad for a 50% discount of $0.99 at the time of writing. The way you play this game by holding your iDevice flat and you tilt it in the direction you want to move in. You have two buttons at our disposal: One to bite down, which you use to eat a fish or shark and another that activates your special powers such as a forward shockwave, or the more powerful all direction shockwave. You collect golden gas balls to get money that you spend to upgrade your food source. 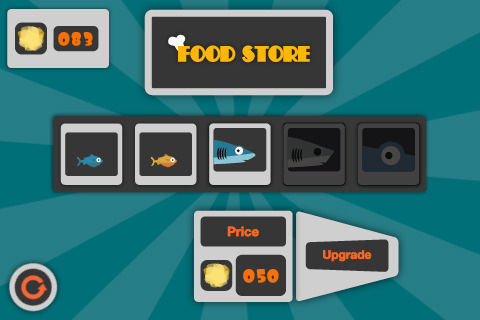 You start off eating blue fish, upgrade to have orange fish appear, another upgrade to have sharks appear, and so on. The graphics for the little ocean critters are highly stylized with a bright color scheme. Your main piranha has a little nuclear symbol on its side, which is actually kind of fun. Generally, the sound effects are nice and do their job but there doesn’t seem to be any music so it’s an incredibly quiet quest to feed your super piranha. The gameplay is alright and the constant upgrading of your food sources is an alright idea, but it gets really repetitive if you have trouble holding the screen in the flat position or if you don’t like the tilt-controls. The weakness of Hungry Piranha is in the technical department. Control-wise, I really wished that the game would allow for an onscreen control scheme, maybe a touch screen alternative. Graphically, the background is almost always a purely solid color, which is boring to look at and doesn’t tell you how close you are to the bottom or tops of the screen. There is an image issue with the waves at the top of the ocean where the images don’t line up properly and end up having a graphical glitch. Sometimes, the warning sign that a homing missile or a giant wall of death is coming is off screen so they come out of nowhere, leaving you no chance to evade them. There are major load issues where it could lag for about 20-30 seconds between every time you replay the game to every time you load up. This game is half and half in terms of quality. The concept, art, and upgrade system are fun and simple but behind the scenes, there are glitches, slowdowns, and a general lack of refinement. I wasn’t impressed during my playthrough because Hungry Piranha doesn’t do anything to push the limits of any genre, but it was entertaining for a couple of minutes before I started noticing the lacking visuals and image misalignments. Good try though, I’ll be happy to re-review this game if they make any updates. Coffee Arcade, please make some upgrades and submit again. Looking forward to it. AppSafari review of Hungry Piranha was written by Joseph Ho on October 26th, 2010 and categorized under Action, App Store, Games, Resource Management. Page viewed 3470 times, 1 so far today. Need help on using these apps? Please read the Help Page.